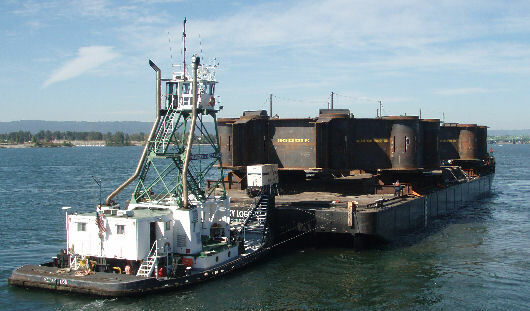 For the new single tower self-anchored suspension bridge between Oakland and Yuerba Buena Island, two steel foundation footings plus two connector beams were transported from their construction site in Vancouver, WA, to the installation site in the San Francisco Bay using the cargo barge LUCKY LOGGER. 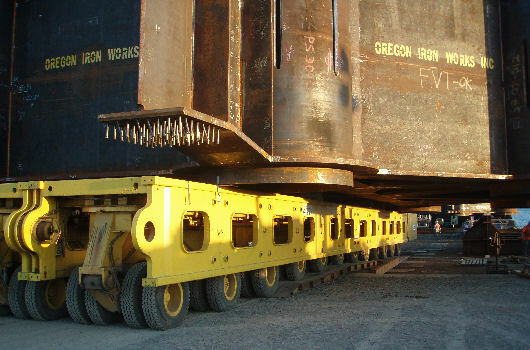 Early September 2006, using a set of 9 Scheuerle self-propelled hydraulic modular trailers, each 1,000 t heavy E2 footing was rolled onto the barge stern over a ramp, while the barge was (de)ballasted to maintain level with the dock. After loading, each footing was lowered onto pre-installed grillage structures. These grillage structures were designed such that they could be re-used with minimum modifications for the T1 footing, to be transported early the following year. 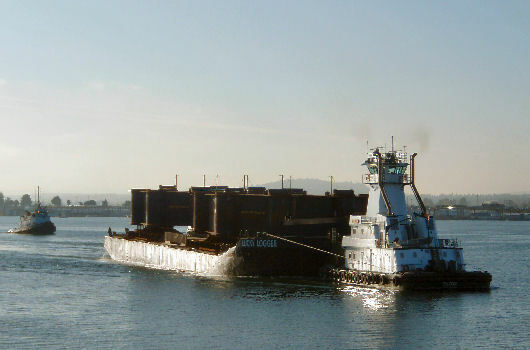 After securing of the footings, connector beams, and miscellaneous items, the loaded barge departed and was towed to Oakland, CA. Upon arrival, the barge was moored for a few weeks in order to complete the pilings. 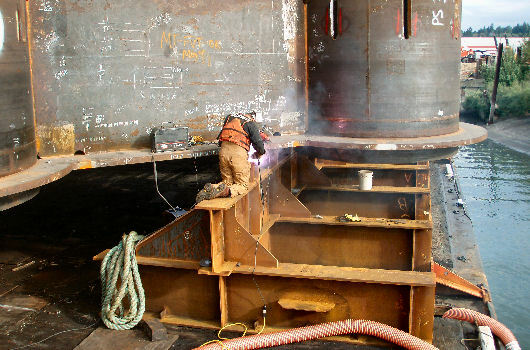 When ready to receive the footings, the barge was ballasted down to a minimum freeboard and the seafastenings were removed. 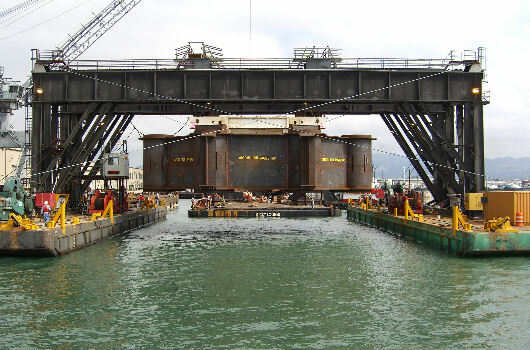 The barge was then positioned under the catamaran lift vessel, which lifted the footings off the barge while the barge was ballasted. The lift vessel was towed out into the Bay and installed the footings over the piles. This same operation was repeated the following year for the slightly larger, but much heavier T1 single tower foundation footing. On-site assistance during loading, seafastening, and lift-off operations.